In the previous post I told about the 16 kbps data stream on FM broadcast frequencies, and my suspicion that it's being used by the bus and tram stop display system here in Helsinki. Now it's time to find out the truth. I had the opportunity to observe a display stuck in the middle of its bootup sequence, displaying a version string. This revealed that the system is called IBus and it's made by the Swedish company Axentia. Sure enough, their website talks about DARC and how it requires no return channel, making it possible to use battery-powered displays in remote areas. Not much else is said about the system, though; there are no specs for the proprietary protocol. So I implemented the five-layer DARC protocol stack in Perl and was left with a stream of fully error-corrected packets on top of Layer 5, separated into hundreds of subchannels. Some of these contained human-readable ISO-8859-1 strings with names of terminal stations. They seemed like an easy starting point for reverse engineering. Each display seems to store in its memory a list of buses that can be expected to pass the stop, along with their destinations in both official languages. The above "bus & destination packets" are used to update the memory. This is done once a day for each display on a narrow-band subchannel, so that updating all the displays takes the whole day. The mapping of the bus stop ID to actual bus stops is not straightforward, and had to be guessed from the lists of buses, on a case-by-case basis. A different kind of packet updates the remaining waiting time for each bus in minutes. This "minutes packet" is sent three times per minute for every display in the system. These packets may contain waiting times for several displays using the same subchannel; the "bus & destination packet" contains an address to the correct minutes slot. (The subchannel address is signaled on a lower protocol layer.) A special flag is used to signify an unused slot; another flag indicates that the bus has no working GPS and that the time is an approximation based on timetables. This causes a tilde "~" to appear before the minutes field. This means all calculation is done centrally and the displays only show numbers they hear on the radio. There's also an announcement packet that's used to sent text messages to the displays. Often these will be about traffic disruptions and diverted routes. It's up to the displays to decide how to display the message; in the low-end battery-powered ones, the actual minutes function is (annoyingly) blanked for the duration of the slowly scrolling message. I have yet to figure out the meaning of some packet types with non-changing data. A special subchannel contains test packets with messages such as "Tämä on Mono-Axentia-testiä... Toimiiko tää ees..." and "Määritykset ja tiedotteet tehty vain Monolla - ei mitään IBus:lla" suggesting that they're planning to migrate from IBus to something called Mono. Interestingly, there's also a repeating test message in German – "Bus 61 nach Flughafen aus Haltestelle 1". What good is it, you ask? Well, who wouldn't want a personal display repeater at home, telling when it's time to go? Hmm, what would be the most straightforward way to figure out if the bus/tram stops in Berlin use the same system? Check Axentia's site for different types of displays they have, and see if they match. actually berlin seems to use http://www.lumino.de/referenzen.html those guys, they mention nothing with radio on their site. but maybe the train cars and busses themselves send something. I found out that they might be using commercial-grade TETRA (non-encrypted). The equipment is made by Funkwerk. Not as easy to listen on as the IBUS system but could be still doable. Actually, it looks more like a case of placeholders in a string that the bus company decided not to use/implement, with "Flughafen" as a placeholder for the the end station, and "Haltestelle 1" for the origin/first stop along the route. No thought was given to actually naming the stations or altering the strings. I hear it's the same. How nice of Axentia to have created such an open system. So, to add to your list of potential applications: helping HSL with bus stop display maintenance tasks. The mentioned Mono (monitorien ohjaus) controls most information displays at terminals. The same suite of sofware also provides the Omat lähdöt -service and API. Mono gets the real time information from a system called Helmi, which is an implementation of the Thoreb IT-radio product. Helmi also controls the non-battery powered displays at bus and tram stops direct. Helmi is rather old and based on a proprietary radio network with Satel radio modems. The buses don't send out their location. Instead they track their location against route and timetable data and send out event messages about their progress. This is basically due to the limited data carrying ability of the radio network. Route and timetable data is updated at the depot via wifi (used to be something else). The real time GPS location information for trams is provided by separate newer devices, which are not installed in buses. Very cool. 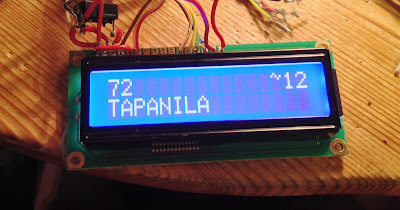 Would it be possible to broadcast your own FM signal to overwrite the displays? Very impressive! I've been looking for this for years - even called the bus company once but they didn't know anything about how it worked. I believe that it's the same system (in a different package) that is used in the Copenhagen area. Would be a lot of fun to try and see if it was really the same system. What confuses me is the broadcasting. is it correct that route information (lines and destinations) are sent once a day to the displays, while the timing information is sent 3 times a minute - to all displays in the system? That should be turned into home decorative. I would put such device to my hallway. Would be handy. No need to check busses from computer anymore. Just go and check near the door, when the next one comes. What would be the smallest form factor hardware setup this could be implemented on? I could actually do the processing on a separate machine and send the data via TCP. So I guess I would be looking at some very simple SoC with WLAN and LCD interface. Any suggestions for this? Arduino can do all of this, save for the DSP stuff. Or you could make your own FPGA. A Raspberry Pi should be able to handle it, I think, and it is rather cheap. 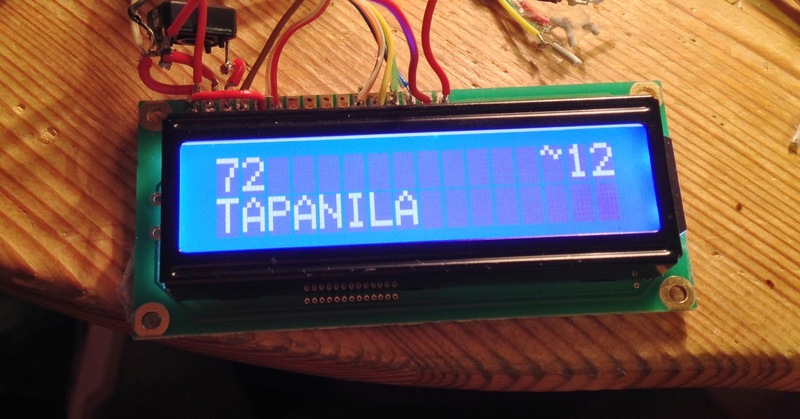 Connecting an LCD display should not be a problem, and Ethernet is there from the start. If you want an embedded solution you may want to check one of the STM32F4 Discovery boards (www.st.com/stm32f4-discovery). The ARM Cortex M4 MCU line is said to have specific DSP instructions, and the 32F429IDISCOVERY (http://www.st.com/web/catalog/tools/FM116/SC959/SS1532/LN1199/PF259090) even has a TFT display. This and the original STM32F4DISCOVERY (http://www.st.com/web/catalog/tools/FM116/SC959/SS1532/LN1199/PF252419) both have USB OTG, but I suspect that you may have to write your own rtl-sdr library for that platform. The boards mentioned above have support for Ethernet but need some external hardware, so one possible solution would be to have e.g. a RPi with the dongle, maybe running rtl_tcp, and let the ARM board handle the DSP part. If you want something smaller than the RPi you could check the Carambola 2 (http://8devices.com/carambola-2) running OpenWRT, I have read about the rtl-sdr library being ported to OpenWRT. Today I spotted a display that was apparently also stuck at bootup, it was showing 8221 IBUS 6.5.100d. Would this be usable for accessing a terminal a few kilometers away where internet access is an issue?